A few bits of embroidery-related news from various spots online, for your Saturday perusal! First, we’ll start with a little information, to enrich your needlework-related knowledge. Dinner first, then dessert. 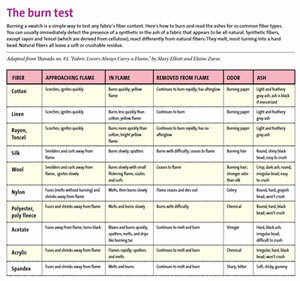 Threads Magazine has an excellent article and video out on how to test the fiber content of fabric, using a burn test. This is my favorite way of testing fabric, to find out of this particular piece is cotton or a cotton blend, if it’s linen, if it’s silk or a blend. They offer a clear chart in PDF format, so you can download it or print it. It’s handy – save it to your computer for future reference! Rouge du Rhin has some surface embroidery kits out that look fun, and they’re now available at The French Needle. I’m a sucker for white embroidery on a natural ground fabric, so I really like this one. The kits come with pre-printed ground fabric, instructions, threads, beads, ribbon, and so forth. They’re suitable for beginners. You might also check out the Canevas Folies kits – they’re pretty floral kits from Switzerland and they involve all kinds of surface embroidery stitches. While these kits don’t come with threads, they are still a great way to explore a variety of stitches in a pretty design. 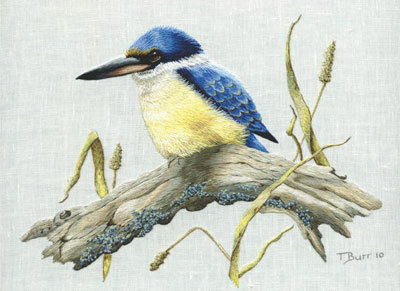 And speaking of embroidery kits, Wooly Thread is carrying Trish Burr’s Sacred Kingfisher kit, which includes the full color instructional booklet, pre-printed design on fabric, needles, and full skeins of all the DMC threads necessary to complete the project. Trish Burr’s kits are not usually available with a full thread pack, so this one is a nice exception. Would You Travel for Needlework? Phillipa Turnbull’s 2014 Lady Anne’s Needlework Retreat has been announced and is accepting bookings. This is one of those Once-In-A-Lifetime Dream Trips. You can read about it at The Crewel Work Company website, here. Make sure you check out the brochure! I’ll be writing a little more about it later on. And in September / October, 2014, Country Bumpkin is hosting Beating Around the Bush again! News has been trickling out about it on the Country Bumpkin page on Facebook. It looks like they’re going to have an Amazing line-up of instructors! Fun, fun! Update, 2017: Country Bumpkin no longer exists as a business. Instead, Inspirations Magazine is the new business “hub” for the magazine and all their events. Speaking of October, 2014, for those who don’t wish to travel quite so far, the EGA has announced their 2014 National Seminar dates and venue details. It’ll be in Phoenix, and the venue looks pretty spectacular. So that’s your Saturday news – hope it gives you something interesting to explore! Enjoy your weekend! May 13, 2017 Needlework News Snips & Goldwork Book Winner! Thanks so much for this information on different events happening in the needle world. I’ve downloaded the fibre burn test thanks, I like the idea of half international shipping costs from Hedgehog Handiwork great. I so wish I could afford Phillipa Turnbull 2014 Lady Anne’s retreat, it certainly would be a dream trip. Thanks for the informative review on needlework news. Thanks for all the news tidbits! I promptly printed off the burn test sheet – something I know I will be using quite frequently. Also checked out the white kit, but alas, they’re sold out already. Not that I needed another project to put on my to-do list, but ‘wanting’ is an entirely different matter! That burn-test chart is a really useful summery. Thank you for the link. I have sometimes had to resort to burn-testing to check unlabelled threads and fabrics, or deliberately mis-labelled ones in some cases. Biting and chewing a tiny piece of thread is also a pretty good guide if you can’t burn it – rayon almost melts in your mouth, silk and cotton are tougher and polyester has a sort of gritty resistance. I don’t know how much time you have to read these comments, but I wanted to drop you a note. 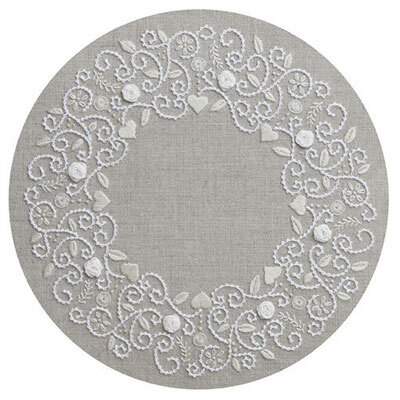 I have been embroidering since I was around 8 years old when my mother got me into crafts. My skills were at a stand still I guess and I shied away from difficult projects. I just happened to find your website one day and since then I haven’t stopped learning new stitches and techniques. Now, at 33, I love to sew more than ever. So, thank you for providing your instructional videos and helpful daily newsletters. Please stay inspired and continue to teach us! I was reading Phillipa Turnbull’s brochure for the Lady Anne Needlework Retreat. Wow, don’t you wish! Phillipa Turnbull has the greatest retreats. To go on one is high on my bucket list! Thanks for the burn test chart!